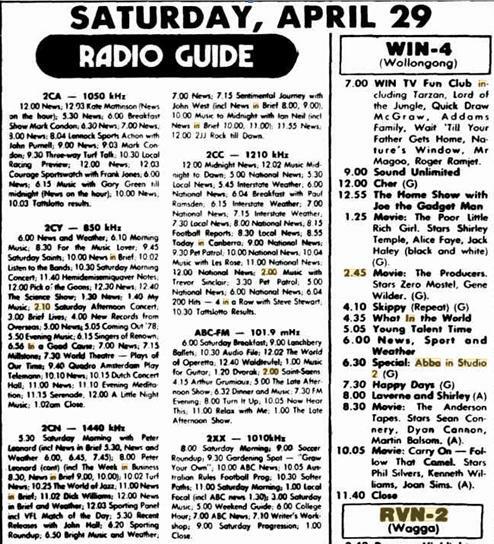 Studio 2 was not a place as thought, but a periodical program series run on Polish TV (TVP1) between 1974-1983 on every third Saturday. 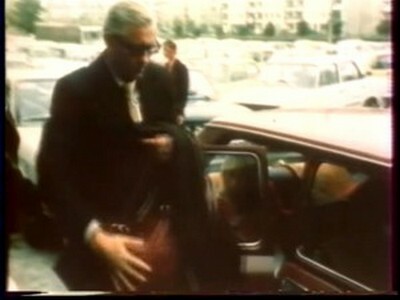 ABBA arrived in Warsaw to promote the forthcoming album Arrival which would released on 11 October 1976. The TVP team made a short documentary about the trip including a short interview with mainly Benny, Björn and Stig which was done by journalists during the flight. 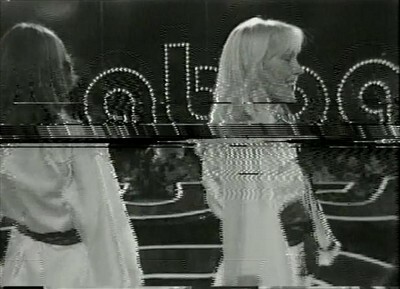 In this show ABBA performed almost all new songs from the new album and the already well-known world hit Fernando twice. 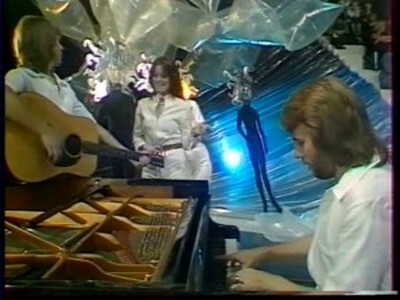 The show also known as ABBA in Poland. Agnetha had travelled ahead with her father the day before and then met Benny, Frida and Björn off the plane. She had filmed SOS the day before and it was interspersed with a rather embarrassed looking Benny, Frida & Björn "singing" on the plane! Knowing Me, Knowing Me was broadcast on the Rage programme in Australia on 3 November 2012 proving it's available for licence and broadcast. Also My Love My Life - it ends rather abruptly with a sudden burst of audience applause. The reason for this is because there's a 2-second long picture and sound error on the master tape. Thankfully it's right at the end of the song. Frida playing air guitar at the end of Knowing Me Knowing You. In the reprise of Fernando, in one shot Frida has lost her hair band yet seconds later it reappears! The Polish TV Studio 2 special flight on Polish Airlines is ready for boarding. The special flight expects the special guests - the pop music group ABBA. Anni-Frid, Benny, Agnetha and Björn - take places please. What does the word "ABBA" mean? Frida: It's very simple. ABBA is the initials of our first name. And my name is Anni-Frid. Benny: I am B - Benny. Björn: And I am the other B - Björn. And my wife is Agnetha. She is actually in Warsaw already. See, when we fly, because we have a daughter of 31/2 years old, we try to fly separately when we can. Why do you have one of the Bs inverted in such a shape? Benny: Well I don't know. It's an idea from our layout man. It's two guys and two girls, two pairs and turned to each other. Which one B is inverted? Björn: Well I don't know. I guess it's me! Benny: Well yes, he is a bit backwards all the time, yeah! Mr Anderson, as a manager of ABBA and also as an author of the words of some songs of this group, would you please tell us something about money? Stig: Well, to start with we have so many fans here in Poland which we know of, so we thought we would like to go down once and do this television programme and we don't take any money for it. Do you want a big crowd at your performance in Poland? Frida: No we don't want any audience in the studio. (Audience is shown again in the studio with shouts of disapproval). I have the connection with the TV studio in Warsaw crowded with people waiting for ABBA - they are very surprised that you don't want audience during the show. Benny: Of course naturally we want an audience. It's much more fun to play in front of an audience. Björn: Nastwowje! Thank you. We are very happy to be in Poland. (Benny, Björn and Frida are reunited with Agnetha as they pose on the steps of the aircraft and then get ready to travel onwards by car). Björn: Thank you very much everybody. Finally, we'd just like to say that it's been a tremendous expeierience for Benny to come here to Poland - and for the rest of us. Frida: Yes, we really have been enjoying this. And I must tell you that you have been a wonderful audience. And we really love you. Thank you very much. Thank you. Björn: OK, OK. Just to show you that we realloy mean what we say, we're gonna do Fernando one more time for you. Thanks to Gabriel Zubowski, Jun Seo, Petr Mlejnek, Jozsef, Philippe Dupont, Philip Muytjens, Erik Leibstaedter, Steve Layton, Sam Shervz, Petri Kaasalainen and Alex Jones and thanks to Intermezzo Magazine for the transcription.